Zee’z Yerba Buena #46 – Radio for the People, by the People. Hey Hey!!! 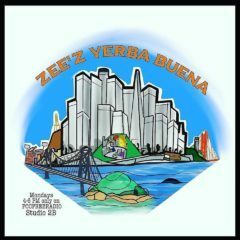 It’s Monday, that means Zee is in Studio2B for Zee’z Yerba Buena!!! Hope everyone had a great weekend! Today’s guest is Mary “Midgett”! I had the pleasure of meeting Midgett way back in the early 2000’s in Bernal Heights! From school teacher, to workshop presenter on all topic of aging, to an author and mother! There isn’t much Midgett can’t do! She also works with local San Francisco non-profits! Be sure to check out her column she writes called Midgett’s Corner! It can be found at Thewesternedition.com! Today we’ll chat with Midgett on her latest work and work she’s done in the past. Be sure to tune in live with the supper easy to use listen live links on the Fccfreeradio.com home page! Zee’z Yerba Buena, 4-6pm Studio2B only at Fccfreeradio.com!!! P.S. Don’t miss the next Tuesday’s Child on Wednesday at Moonlight Cafe Wednesday Feb.20! Get your tickets here!! !